A great digital SLR, like the Canon EOS Rebel, makes it easier for photographers of all skill levels to capture great photos. One of the most helpful features of the Canon EOS Digital Rebel XSi/450D is the Camera Function Settings display, which keeps you updated on some of the important settings that can make or break a photograph. The Camera Function Settings display is shown here. Keep in mind, however, that this screen is purely an informational tool; you can’t actually adjust any of the reported settings from this screen. To display the Camera Function Settings screen, first display the camera menus by pressing the Menu button. Then press the DISP button. These are the settings that you can monitor when shooting in the advanced exposure modes (P, Tv, Av, M, and A-DEP). Here are the details you can glean from the display, with settings listed in the order they appear on the screen. Freespace: This value indicates how much storage space is left on your camera memory card. How many pictures you can fit into that space depends on the Quality setting you select. Color Space: This value tells you whether the camera is capturing images in the sRGB or Adobe RGB color space. White Balance Shift/Bracketing: White balancing neutralizes light so that whites are always white, which in turn ensures that other colors are rendered accurately. Although Auto is the usual selection, you can also choose Daylight, Shade, Cloudy, Tungsten, White Fluorescent, Flash, and Custom in the advanced exposure modes. With White Balance Bracketing (using a grid based on the color pairs of blue/amber and green/magenta), the camera records the same image three times, using a slightly different white balance adjustment for each. Live View Shooting: This feature enables you to use your monitor instead of the viewfinder to compose your shots. Auto Sensor Cleaning and Red-Eye Reduction flash mode: (These two functions share a line in the screen.) By default, the camera’s sensor-cleaning mechanism activates each time you turn the camera on and off. Alternatively, you can choose to initiate a cleaning cycle or to prepare the camera for manual cleaning. Red-Eye Reduction flash mode is accessible in any exposure mode that permits flash and lights up the Red-Eye Reduction lamp on the front of the camera when you press the shutter button halfway. The purpose of this light is to attempt to shrink the subject’s pupils, which helps reduce the chances of red-eye. The flash itself fires when you press the shutter button the rest of the way. Auto Power Off and Auto Rotate: Auto Power Off controls how quickly, if at all, the camera automatically powers down after a certain period of inactivity. Auto Rotate, when enabled, adds information about the orientation of the camera to each picture file. Then, when you view the picture on the camera monitor or on your computer, the image is automatically rotated to the correct orientation. Beep and LCD Auto Off: The first setting determines whether the camera beeps after certain operations. 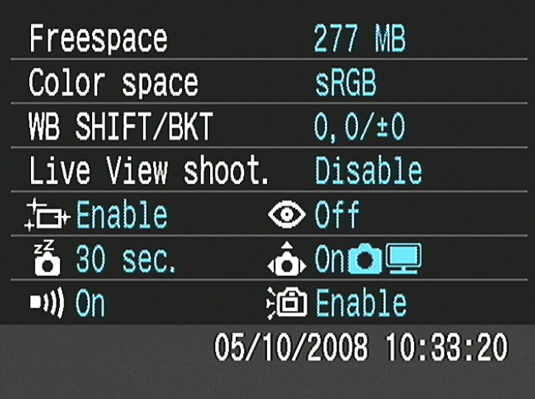 The second setting controls whether the camera monitor turns off automatically when you put your eye to the viewfinder. Date/Time: The camera’s date and time are displayed here. This information is recorded as part of each image file, so it’s important to keep the date/time accurate.